Supermodel Heidi Klum got engaged to Musician boyfriend Tom Kaulitz after dating for one year. December is definitely the month of love. Throughout this month, we witnessed many Hollywood couples getting engaged and married. Continuing to the tradition, we have another new couple who recently got involved in a marriage engagement. And this time, it's none other than Supermodel Heidi Klum. America's Got Talent judge aka Heidi Klum got engaged to Musician Tom Kaulitz. The pair dated for nearly a year before finally taking the next step in their relationship a day earlier. The 45 years old model herself broke the happy news of the engagement on her Instagram on the day of Christmas Eve. The model respectively posted a picture of her with now fiance Tom in a monochrome filter showing off her diamond engagement ring. Klum, 45 and Kaulitz, 29 share an age gap of 17 years between them. But, as they say, age is just a number. Klum on her current relationship says she doesn’t really think about it that much although lots of people keep asking and questioning about it. The two went public on their relationship in May this year. Klum who is the first successful German model to walk the Victoria Secret runway was previously married to Ric Pipino, from 1997 to 2002. Ric is a famous Australian Hair Stylist. After separating from Ric, the model met British singer and songwriter, Seal to whom she was married from 2005 to 2014. The former couple even shares three biological children together. 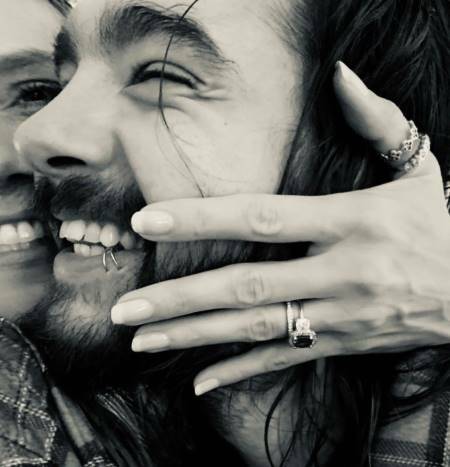 Best wishes to the newly engaged Klum and Kaulitz.